Thrawn, the most anticipated Star Wars book since Disney bought Lucasfilm and declared the old Expanded Universe novels to no longer be canon, is out today. And the things being introduced in it already have Wookiepedia entries. Full disclosure, I am only on page five but as semi-familiar names started popping up, I did what any good nerd would and popped over to Wookiepedia to see if these things were being recanonized from what is now called the “Legends” line of books and, if so, to see how they’ve changed. I soon discovered that there are a bunch of new entries that already have stubs waiting for them. Despite the entries all having warnings, there aren’t really spoilers, since the people updating don’t appear to have much more information than I do. But the character Eli Vanto is introduced on page four and he has a one-line page already. Sy Bisti, a language from the old canon re-introduced on page four, now has a canon tab to go along with the Legends tab from the old books. It’s also only a line long. More substantive is the article on the Unknown Alien Protocols, which has a whole description to go with its introduction on page five—and all of that is now on Wookiepedia as well. Looking at the history of edits for all three of these pages shows they were either created or at least updated today, because fandom waits for no one. The need to put all new knowledge into a database and categorize is strong among us. Just look at my instinctive reaction, only a few pages in, to check Wookiepedia. The impulse not just to index, but to do it publicly and to share information is almost sweet. I’m sure there’s a dark side to this—like something about not just savoring a book as it comes—but mostly I feel so connected to all the other fans reading this book with the same excitement. 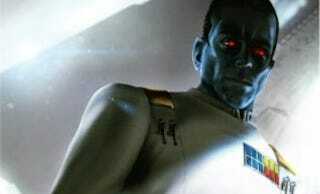 I love you all, crazy Thrawn fans.